Editor's note: This blog was originally posted in August 2013 and has been revamped and updated for accuracy. If you haven’t experienced one of our fun and spicy Zumba® classes yet, give it a try and find out why Zumba is sweeping the nation! These classes combine Latin dance moves with hip hop, belly dancing, and traditional fitness moves. Cardio intervals, motivating music, and choreography that everyone can do will make you keep coming back for more! The best part about the Zumba dance class at California Family Fitness is that it’s a high-energy workout AND it’s easy to learn, making it perfect for people of all fitness levels. If you need a break for water or to catch your breath, you just step away and jump back in when you’re ready. No pressure, no competition, no complicated moves...just fun! Each one of our 19 locations in the greater Sacramento area offer Zumba classes during the week, so you can choose a class that best fits your schedule. 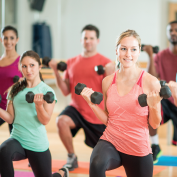 Just go to Cal Fit's Fitness Class Schedule page, select your most convenient location, and you'll be able to see when the classes are offered. And our Zumba instructors at each location do a great job at leading you in a power dance session that will truly get your body moving and your heart pumping!